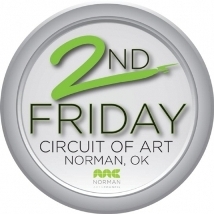 Norman hosts the 2nd Friday Circuit of Art. The 2nd Friday Circuit of Art, a monthly celebration of the arts in Norman, connects the downtown arts district with outlying galleries, performance halls and Campus Corner. Through a collaboration of artists, art organizations, businesses and the Norman Arts Council, the entire city of Norman becomes an arts district, culminating in a wonderful experience of music, visual art and lots of fun. Whether you like dance, painting, photography or music, there will be something for you to see and hear during the 2nd Friday Circuit of Art in Norman. As always, all events are free and open to the public. Whether you like dance, painting, photography or music, there will be something for you to see and hear during the 2nd Friday Circuit of Art in Norman.